Jejich poslední nahrávka je sice EPčko "Support Cannibalism" už z roku 2011, ale neskutečně brutální deathmetal téhle čtveřice z Vídně je dostal až na kraj světa. V roce 2011 odehráli obscénní deathmetalové show po celé Evropě, od Španělska po Ukrajinu, a v roce 2012 spolu se SEVERENCE po celých Spojených státech. Je jen přirozené, že se takoví zcestovalí mistři výbušného deathmetalu taky konečně objeví na největší a nejlepší death, grind, punk party na světě – na OBSCENE EXTREME 2013!!! When there is no more room in hell, the dead will walk in Vienna. 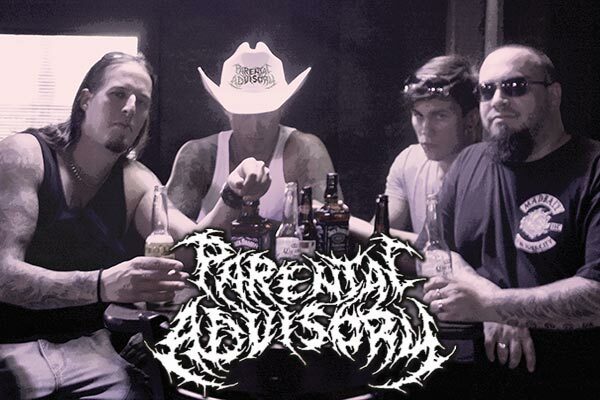 PARENTAL ADVISORY – known as a sign to warn parents of explicit contents on records and, by-the-way, increase sales of those long-players – it is also the name of a veteran Viennese Death Metal outfit. Founded in 1997 by Sic, Otto, Marathon and René they set out to raise the dead. Influenced by bands like Cannibal Corpse, Morbid Angel or Deicide they combined the best of 90ies Death Metal with its heaviness and groove and ultra-deep growls. Being huge fans of the Horror-genre they, naturally, based their lyrical concept on everything undead and brain-eating and living up to their name by graphic descriptions of hell on earth. After some crushing live-shows they quickly gathered a growing fan-base around them and recorded their first demos, “Butcher” in 1998 and “Infested With Zombies” in 1999. Both were sold out soon afterwards. Always feeling at home onstage the band played many shows in Austria aswell as abroad including support-slots for acts like IMMOLATION (USA), EMINENCE (BRA) and DARKEST HOUR (USA). In summer 2000 they went on their first tour through Austria together with fellow Viennese heavyweights SEEDS OF SORROW and CRYOSPHERE. Following their tour they had their first line-up change, drummer René leaving the band and being replaced by Beisser, a good friend of the guys. 2004 brought the bands first full-length album “Zombie Legion” which received very good critics throughout the underground media. Promoting their record they toured their asses off all over Europe and shared the stage with bands like DYING FETUS (USA), DEEDS OF FLESH (USA), GWAR (USA), HEAVEN SHALL BURN (GER) and PUNGENT STENCH (AUT). During this time the band saw another line-up change when, again, the drummer left. Instead of Beisser now Tom, former drumkit-destroyer at SEEDS OF SORROW joined the lot. Four long years later - at last - a new album was recorded, “The Wither Process”. This new material was recorded/engineered by Gregor Marboe, a friend of the band and PUNGENT STENCH/HOLLENTHON bassplayer and released by the Czech label NICE TO EAT YOU Records. It showed the steady progress of the band. Merciless Brutal Death Metal, fast, technical and yet always with a heavy groove at hand to deliver the finishing punch. After two more years of playing shows and writing new songs the band decided to enter the studio again. They joined forces with Norbert Leitner at HINTERHOF STUDIOS to record the EP “Support Cannibalism”. The EP was finished in late 2010 and available for FREE DOWNLOAD in February 2011. This way the band wanted to thank all the fans and show their gratitude for the support throughout the years! February 2011 was not only the release-month of their new EP, but also brought them the opportunity to play far away from home for the first time, at the mighty KIEV SONIC MASSACRE II festival. There they shared the stage with heavy-hitters from all over the world, including KATALEPSY (RUS), SEVERANCE (USA), INFERIA (FIN), HOLOCAUSTO CANIBAL (POR) and many others. The show was a huge success for the band and gained them many new supporters and friends. Among the new friends and supporters was the Texas-based band SEVERANCE, with which the boys in PARENTAL ADVISORY got along very well and formed a mutual-friendship. This, as it turned out, was the beginning of their biggest undertaking so far, a tour in the USA. In June 2012 they embarked on the “Spreading Death Across Texas” tour together with fellow disciples of brutality SEVERANCE and local support-bands. They played several shows, including the LAS VEGAS DEATHFEST IV pre-fest. They took Texas by storm. Again they proved their ability to get on stage and take no prisoners. So far it has been an amazing ride, and we can´t wait to see what future has in store.